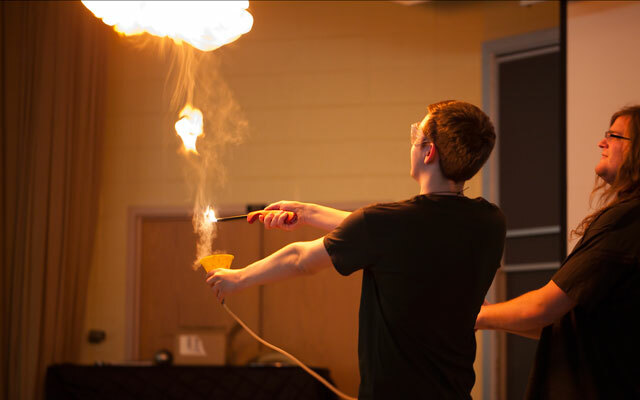 Why Study Physics and Engineering at Juniata College? Follow in the footsteps of the inventor of the Hemi Engine and a Nobel Prize Winner in Physics. Blend your study of physics with exceptional engineering courses. Conduct research as an undergraduate on campus or at national labs like the National Institute of Standards and Technology (NIST) in Gaithersburg, Md. or Pacific Northwest National Labs in Hanover, Wash.
Travel to Lowell Observatory in Flagstaff, Arizona to conduct astronomical observations with a professional 31-inch telescope. Study in India, Australia, England, France, Japan, Germany, Czechoslovakia, among others. Create interdisciplinary programs combining Physics with Mathematics, Biology (pre-med), Chemistry, Criminal Justice, Information Technology, Digital Media, Religious Studies and others. Find the blend that works for you!